THERE ARE MUSICALS I love more than The Cradle Will Rock, and many which are technically better, but I get stuck on Cradle. It’s a strange mix: Unapologetic agitprop, broad comedy, bitter anger, giddy idealism, cutting satire, emotional testimony…it’s so many different things. Yet it’s not just simple but simplistic, with cardboard characters who have descriptive names standing up and explicitly announcing who they are, how they feel, and what they want. I think it works for two reasons. First, candor is refreshing, especially in musicals. Someone said, “If it isn’t art, it isn’t propaganda.” (The line has been attributed to both Upton Sinclair and Diego Rivera, and I’m sure they would be willing to share it equally.) It can be very gratifying when a work of art makes you feel something by involving you in a dramatic story and making you identify with complex, fully-realized human characters — but that’s just one approach. Cradle makes you feel something in another way, by the power of its convictions, the strength of its ideas, and the other reason this work continues to resonate and fascinate: the music, which remains excellent, challenging, and unexpected. Much has been made of the connection to Kurt Weill, which is undeniable. In Blitzstein’s early, avant-garde period, he had expressed disdain for would-be elite composers who, like Weill, appropriated jazz and other popular forms to make their work more accessible. But after a trip to Europe and a political awakening, Blitzstein was newly interested in writing accessible work, because he was suddenly burning with social conscience and wanted to reach people with his art. Weill rose in the younger composer’s estimation; Blitzstein openly admired The Threepenny Opera, which he would later translate to great success, and befriended Weill’s collaborator Bertolt Brecht. Blitzstein’s wife, Eva Goldbeck, had translated a number of Brecht works (among them Threepenny Novel) into English, and Blitzstein was able to show Brecht his song sketch for “The Nickel Under the Foot.” It was Brecht who suggested expanding the sketch into a longer work which equated prostitution and capitalism. The Cradle Will Rock, written “at white heat” after Eva’s death, was dedicated to Brecht, and it did sound something like Kurt Weill. Nevertheless, from the standpoint of musical storytelling, Blitzstein uses Weill’s techniques in more sophisticated ways than Weill. The Threepenny Opera is song, scene, song, scene; and, Brecht being Brecht, the songs are commentaries, interruptions. Blitzstein, as composer, lyricist, and librettist, interweaves song and dialogue to a degree unprecedented in the musical theater in 1937, and still rare. He was a master of the concise statement; Cradle is full of very short songs that say what they have to say and then stop, sometimes to set up other songs, as in the abrupt transition from “Let’s Do Something” to “Honolulu,” which always gets a laugh. Until Bernstein and Sondheim, nobody in musicals attempted Blitzstein’s level of compositional design, his use of themes and motifs, and his ability to express character and advance story through songs — except, of course, for Gershwin. Porgy and Bess preceded Cradle by one year, and its authors, like Blitzstein, always referred to their musical as an opera. IN MY RECENT exploration of The Cradle Will Rock, I’ve developed an appreciation for its original cast recording which had eluded me before. (You can listen to it here.) It was recorded in 1938, with Marc Blitzstein and the original cast, during the show’s run at the Windsor Theatre. It’s considered the first Broadway musical cast recording. The record has often been dismissed as a curiosity — an artifact of historical interest, but not much for listening pleasure. I listened to it once, years ago, and went along dismissing it with everyone else. But having carefully revisited the recording, I’ve found much to love. Because it’s primitive and scratchy, the best way to enjoy the original Cradle record is to know the material well before you listen to it. I am now so familiar with the score from repeated listenings, mostly to the excellent 1985 Acting Company recording, that I can enjoy the 1938 record without frustration. It’s made me feel closer than ever to the night of June 16, 1937. 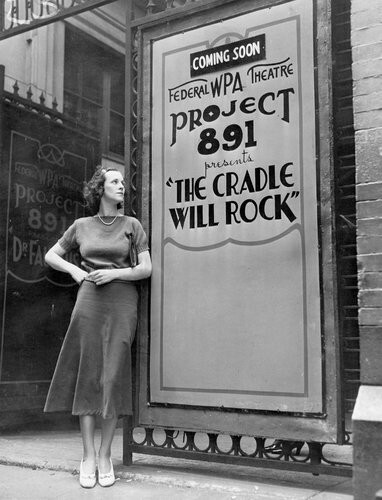 Despite the strength of Blitzstein’s work, it’s true that a great deal of Cradle’s appeal has to do with the circumstances of its original production and its first public performance — certainly one of the greatest theatre stories ever told. So, what I find most overwhelming about the original cast recording is that this is the original cast. These are the actual members of Federal Theatre Project 891, who rose from their seats at the Venice Theatre on June 16, 1937, in defiance of their government, their employer, their union, and their economic self-interest, and lent their voices to Blitzstein’s songs. That’s the real Olive Stanton. The real Olive Stanton, outside Maxine Elliott’s Theatre, in the summer of 1937. Based on the written reminiscences of John Houseman, Orson Welles, and Marc Blitzstein, and the Tim Robbins film freely adapted from these events, I had come to regard Olive Stanton as an accidental revolutionary hero. Houseman calls her “an inexperienced performer” who “held no political views whatsoever,” and quotes original cast member Hiram Sherman: “If Olive Stanton had not risen on cue in the box, I doubt if the rest of us would have had the courage to stand up and carry on.” Tim Robbins fictionalizes her as a homeless waif who can barely sing. 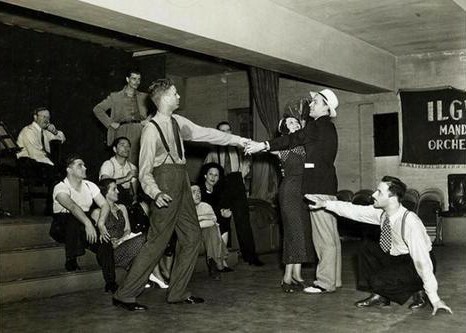 Blitzstein biographer Eric A. Gordon says that she “had never appeared on Broadway before,” but the Internet Broadway Database has her in Class of ’29, a Federal Theatre production that ran for fifty performances in 1936. That’s more experience than some other members of the company had. I think Olive Stanton is wonderful on the record. Most accounts of June 16, 1937 describe a timid, quavering soprano joining Blitzstein’s tenor during the opening song, but maybe it was nerves — the record shows that Ms. Stanton had a husky, sighing alto voice, full of the same combination of optimism and world-weariness that pervades Blitzstein’s writing. In the very first sung line of the show, her voice rises up on the word home, and it’s instantly moving; it makes perfect sense that Welles saw her as a plaintive survivor. Her singing is unpolished, honest, and expressive. On “The Nickel Under The Foot,” she sings with a drawn, weary, unsteady voice that suggests Blitzstein was grooming his own Lotte Lenya. Listen to Lenya on Threepenny, and listen to Blitzstein’s own recording of “The Nickel Under The Foot,” and they sort of add up to Olive Stanton. Blitzstein seems to have liked her; he later cast her in a concert version of his “radio opera” I’ve Got the Tune, and regarded her as a standard against which to measure future interpreters of the role of Moll in Cradle. It is, I suppose, the definitive rendition of “The Nickel Under The Foot,” and it’s almost the best. It seems to me there’s a change of tone built into the final verse of this song, and only Patti LuPone has marked it with the proper rueful vocal surge. Olive Stanton just marches to the end. It’s probably not fair to compare Olive Stanton to Patti LuPone, but listen to the 1964 Blitzstein memorial concert — Barbara Harris is a pro, and she doesn’t come close to Stanton in emotional expression. Elsewhere where I’ve written about Cradle, I’ve declared my love for Howard da Silva. It’s impossible for me to hear the name Benjamin Franklin without thinking of da Silva’s brilliant performance in 1776. He also created the role of Judd Fry in Oklahoma! and appeared in dozens of films and TV shows. But the role he was actually born to play was Larry Foreman in The Cradle Will Rock. Da Silva had been a steelworker before he became an actor, and during the original production of Cradle, he impressed John Houseman as “one of the stalwarts” who believed in the show’s message and could be counted on that night at the Venice Theatre. Da Silva kept Cradle close throughout his career, frequently reprising the role of Larry Foreman, and later directing numerous incarnations of the show, on and off Broadway. The third of Houseman’s stalwarts was Hiram Sherman, who originated the roles of Reverend Salvation and Junior Mister. He was in the cast at the Venice, and in the subsequent run at Houseman and Welles’ Mercury Theatre, but he does not seem to have followed the show to the Windsor, and I don’t think he’s on the 1938 recording. I haven’t been able to find an authoritative cast listing for this record, but it does sound like the same actor is playing those two roles, though IBDB lists Maynard Holmes as Junior Mister and Charles Niemeyer as Reverend Salvation for the Windsor run. In any case, Hiram Sherman definitely does sing Reverend Salvation in the 1964 concert, and he doesn’t sound like anybody on the earlier record. Whoever is playing Reverend Salvation — let’s call him, oh, Charles Niemeyer — his performance is among the weaker ones. Another is Blanche Collins, who sings what should be the show’s angriest song, “Joe Worker.” Both of these roles were better served by later interpreters with bigger, more soulful voices. John Adair as Harry Druggist is doing something weird with his voice, and Howard Bird as Stevie speaks his lyrics as though he is attending a robot seder. Peggy Coudray, as Mrs. Mister, has an interesting sound, but she rushes through the material and misses a lot of the humor. Both of the comic twosomes — Maynard Holmes and Dulce Fox as Junior and Sister Mister, and Edward Fuller and Jules Schmidt as Yasha and Dauber — are terrific, with Fuller and Schmidt in particular setting the tone for all future interpretations of their roles. But that can be said generally about the entire 1938 album, and that’s part of its value. It is the seminal document of Cradle as a performance style. There’s a Cradle Will Rock style, unique to this show, that I think has a lot to do with the manner and diction of Marc Blitzstein himself, and also with original director Orson Welles’ flair for explosive drama. It’s striking how often different actors give the same line readings in different productions of Cradle, especially those directed by da Silva or Houseman. 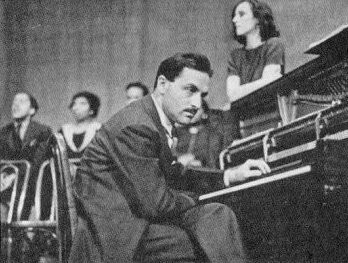 THE MOST POWERFUL presence on the 1938 record is Marc Blitzstein himself. In addition to playing the piano (which is, per tradition, the only accompaniment), he narrates the story and plays a few of the smaller roles, as he did at the Venice Theatre. He has a lot of fun at the piano, and I can almost see his smile during some of the score’s percussive, dissonant passages. His voice is high, his diction clipped, but he sounds much more natural and at ease than on his “Nickel Under the Foot” demo, where the vocal affectations make for a difficult listen. No other composer in Broadway history has wound up so literally in the middle of his own musical. 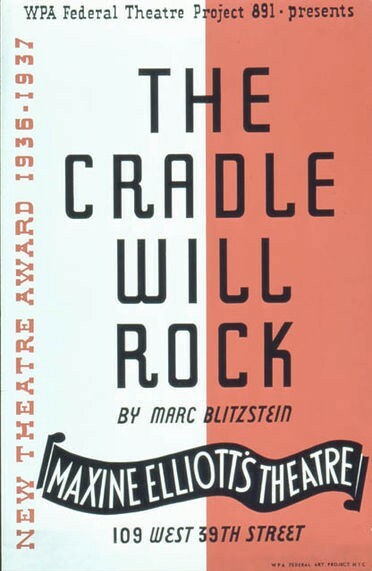 Marc Blitzstein was not a member of the cast or the orchestra of the original production of The Cradle Will Rock, until the events of June 16, 1937 rewrote Orson Welles’ concept. What was to be an enormous, high-spectacle production became the composer at the piano. It was minimalism, the antithesis of the Broadway musical, and it turned out to be the perfect approach for this Broadway musical, which criticizes greed and excess. I mean: Imagine a show that begins with a bare stage, some empty chairs, and a piano, and then the author of the show walks out on stage, sits down at the piano, and presents his work. He summons actors as if from his imagination. It’s the writer as god, with the aesthetics of a backers audition. It’s a portable musical, and it’s been unpacked many times over the years, and it always sounds the same. The Project 891 cast emotes and declaims just as all future Cradle casts will, including just a few weeks ago at the New York City Center. That production had no direct pedigree from Project 891 (though it was nice to see Henry Stram, who was in the Robbins film). But most of the cast delivered their material in this same Blitzstein trance, that precise blend of sarcasm and earnestness that puts this particular piece across. Maybe it’s in the music; maybe it’s in the air. But somehow, this guy is still singing to us.